For those with poor hand function or a weak grip, this utensil holder has a half cone shaped plastic base, which angles the utensil away from the palm to make eating pattern easier. 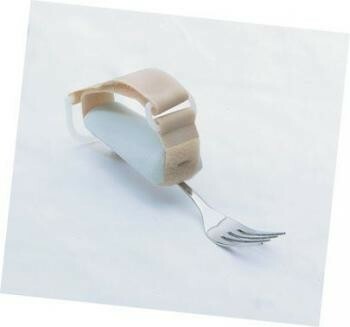 Built-Up Utensil Holder...For those with poor hand function or a weak grip, this utensil holder has a half cone shaped plastic base, which angles the utensil away from the palm to make eating pattern easier. May be used with cutlery, pens, etc. The hook and loop fastening enables the holder to be adjusted to fit most hands.